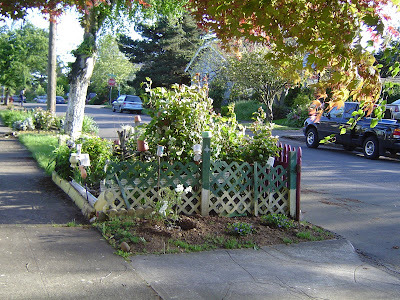 Inspired by a request from Karen at Greenwalks to take pictures of my neighbors parking strip garden, I snapped a few pictures of other sidewalk gardens around NE Portland. By no means is this a scientific sampling, just random scenes that caught my eye on my drive home and walk around the neighborhood. 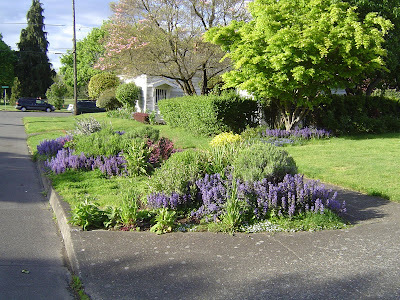 I’ll do a follow up someday that shows more of the fabulous sidewalk gardens in the city. I am afraid a couple of these are verging on the bizarre. 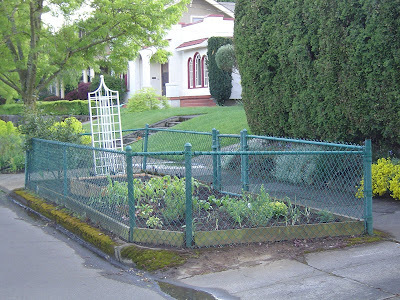 What gives….hungry vegetable thieves? A marauding dog? Snacking raccoons? Well they certainly aren’t taking any chances now are they? Next door to the veggie Ft Knox is this Euphorbia dreamscape. And just across the street this. Knowing how these Euphorbia tend to self seed do you suppose the wind, or a bird, carried the seed across the street? Then the owners of the previously empty gravel strip just didn’t have the heart to rip out this brave pioneer in no-man’s land? This packed parking strip belongs to a neighbor of mine. We recently found out that she is 82 years old. She doesn’t look, or act, a day over 65. Proof that gardening keeps you young! 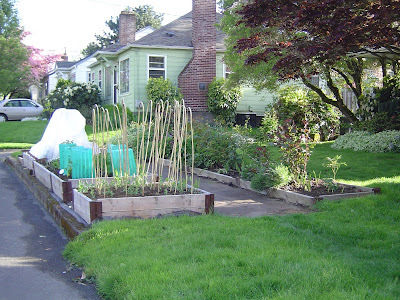 Here and at the very top are the requested pictures of the other neighbor’s garden boxes. She has tomatoes, peas, spinach, tons of lettuce (we’ve already been gifted 2 big bowls!) a fig tree, onions and carrots in here – maybe more. The lettuce is under the protective fabric. The peas are starting to climb the bamboo U’s. Now that I'm posting I realize I really should have taken a close up. Duh. Sorry. 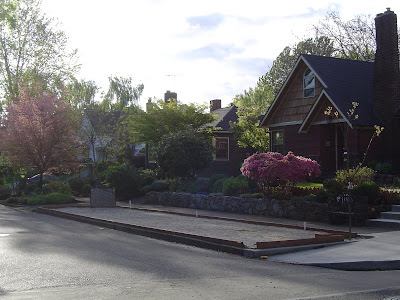 Some of you may notice that the sidewalk just abruptly ends; it’s the same on both sides of the street. I have no idea why this is. The same thing happens with the streets here in Portland. One moment you are driving along a perfectly normal paved street and the next minute it’s dirt and full of pot-holes. 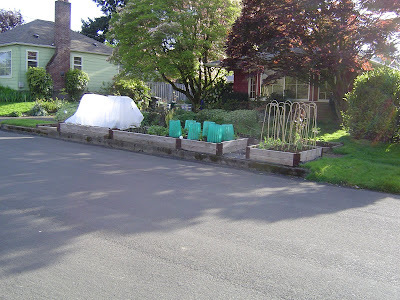 And I’m not talking about rural Portland, this happens in the inner east-side neighborhoods! Ok, back on topic…this one we refer to as the project strip. I had huge hopes for this when it started, 3 or 4 years ago. Then nothing. Dunno. A very study little box. Not a veggie in sight but lots of happy lilies, grass and euphorbia. My parking strip. 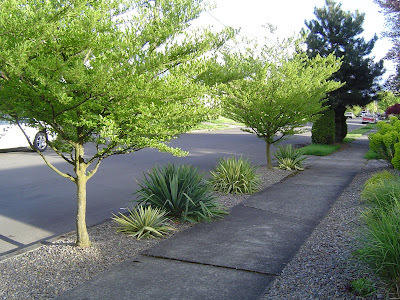 Kinda boring, just yucca and Japanese snow bells, one of the official Friends of Trees street trees here in Portland. The husband wanted to rip them out when we moved in but he’s grown to tolerate and maybe even them. I liked them simply because they already had a few years growth. Maturity won out in this case (the trees, not mine). The yucca were chosen because I don’t have to water them and they look good while being tough. We get a lot of soccer parking here on weekends (there is a park at the end of the street), the yucca bite back if someone gets too close! I’ve seen the owner out in her housecoat weeding in the early morning hours and I swear she had rollers in her hair, doesn’t it just figure? The front yard is more of the same. I’m just glad that I don’t have to look at this everyday. It would drive me insane. These boxes are on a very busy street that heads into a ‘not so nice’ part of town. When they went up I was afraid I’d see them vandalized but so far not at all. I also keep expecting to see a vine growing on the cross pieces, or something that explains their purpose. Not yet. These boxes are always full of something blooming. I wonder if she digs the bulbs or just leaves them? 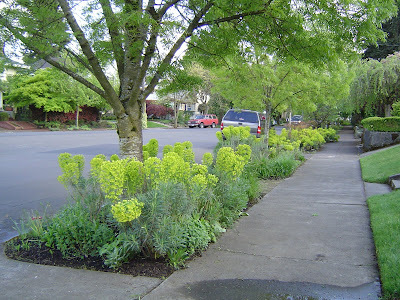 Lastly I had to snap a shot of this little parking strip forest. I wish my camera would have captured the deep deep blue of the California Lilac. I keep thinking I’ll plant one of these someday. They are just so electric when they bloom. Well that’s the end of today’s tour. Hope you enjoyed! 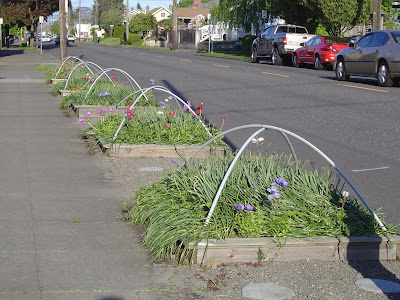 And if you are up for a little more reading here is a link to a story from our local newspaper, seems someone’s sidewalk planter boxes offended the neighbors and they turned them in. What a fun tour you took us on! I love to see what trips people's triggers when it comes to gardening! Some people are certainly different! Wow, you really found a lot! I'm going to have to look harder, and it different 'hoods, next trip to Portland. Thanks so much for the link and for keeping me in the loop on what's going on in your neck of the woods! I love the variety, you can see how people have decided to either go for it, in a variety of styles, or just reject the whole concept. Fort Knox garden, I'm sure that was born of some epic battle as you say! Too hilarious. 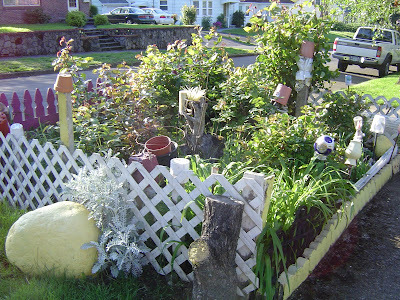 The nutty ramshackle garden is charming in its way too, even though it's kind of a mess. Better than gravel, for sure! Very very cool post. PS I bet the PVC crosspieces in the second-to-last photo are to enclose winter veggies. 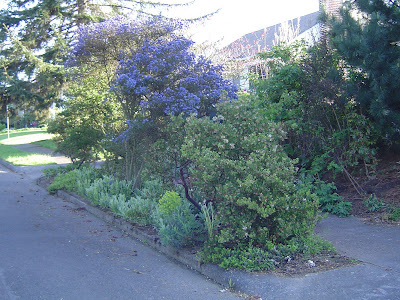 And yes, you should get a ceanothus! They are pretty hardy, mine lived through this past awful winter with no issues. I kept forgetting to shake the snow off it, but it didn't break and doesn't even seem to have any frost damage! They could not be more of a bee magnet, always a plus if you have veggies or fruit to pollinate at the same time as when they're blooming. PPS I love Japanese snowbells, I'm glad you decided to keep yours! I think they are such charming trees. I planted one but didn't take very good care of it initially so it's probably not going to grow very well. Yuccas scare me, I'd stay away from those for sure if I had a soccer game close by! Did you add the gravel or was it already there? 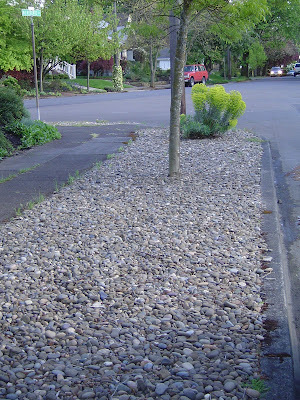 Can you plant more stuff in it and just keep the rocks as mulch? 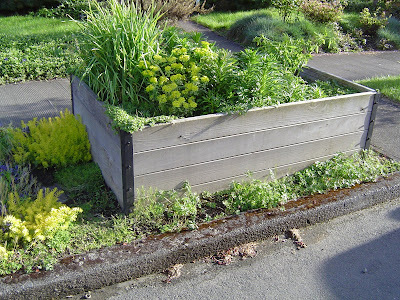 That's kind of the new trendy xeriscape thing, seems like. OK, I'll shut up now! 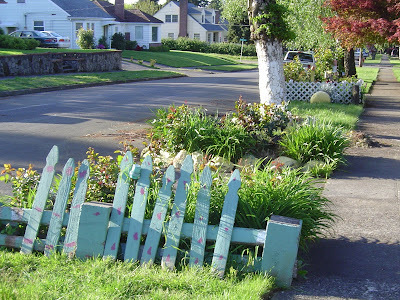 I failed to consider painting my chain link fence bright green. Hmm, I still think black. My money's on a marauding dog. My front yard is a favorite place for the neighborhood dogs to stop, so anything edible out front would need some serious protection. I hope some day I just walk around in rollers and a housecoat. I want to grow up to be that kind of old lady. And probably some gold high heeled slippers. Maybe she doesn't wear those, but that's how I prefer to picture her, like my landlord when I was a kid. Heather - Glad you enjoyed it! It's fun to see what others are up isn't it? Karen - I thought the same about winter veggies but this lady is all about the flowers. She has given me blood grass and hen's-n-chicks because she just doesn't have place in her garden for anything but flowers. She walks by my place and sees that flowers are not such a priority. Ok...Ceanothus is officially a must have. I won't pass it up if I see it! We added the gravel. I love gravel and can't get enough of it. I don't think I could plant more as we really need the empty space we have for our trash pick up days and for folks trying to get out of their cars. We do really get a lot of park traffic on the street, which we sort of love. Very glad you enjoyed the post. Glad you're convinced you need ceanothus. We have two and they're getting BIGGER...can't wait until they touch! I loved your tour and your sweetly snarky comments made it even better! Believe it or not, Lowes, for one of them. Mine are Victoria, but look in your Sunset guide for lots of different varieties. I know I've seen some at Portland Nursery, too. love your blog. so cute. and this cracks me up because i've been recently taking notice of everyone's parking strips to get ideas for ours. we have a snowbell planted at each end and we just tore up the grass that covered the rest. it's only about two and a half feet wide and yet i can't decide how to fill the rest! the debate between me and my husband is whether to accomodate people parking in front of our house or make it more difficult?